Rural Health Group now has the ability to provide telehealth visits to our patients. This means that patients can see a provider from the comfort of their home via the internet. Telehealth is the use of digital information and communication technologies, such as computers and mobile devices, to access health care services remotely and manage your health care. These may be technologies you use from home or that your doctor uses to improve or support health care services. How can telehealth help RHG patients? Using teleheath technology, patients can use their computer or smart phone to initiate a secure web session with their provider. This service is particularly helpful for patients who are not able to travel or who need provider after normal clinic hours. When are telehealth visits available? Rural Health Group will have a provider available for telehealth visits from 8:30am until 9pm. 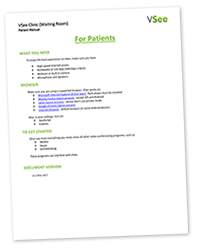 What do patients need to get started? Patients will be asked to pay for each telehealth visit at the time of the visit via credit or debit card. The fee is $35 per visit. The Vsee Clinic app is available from the App Store and Google Play Store.